Pictured are all the members of the Columbia High School Flight Crew. They are, front row, from left, Grace Grant, Emily Sheble, Katie Lantsberger and Taylor Ratajczyk; back row: Jordan Giovanetti, Jonathan Whelan, Greg Rudock and Luke Schult. 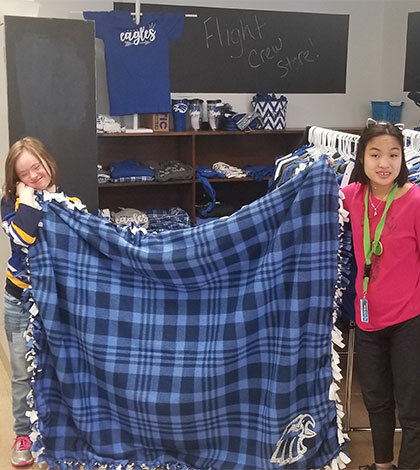 Pictured are Emily Sheble and Grace Grant with a blanket their class customized using their new heat press and Cricut. The Columbia High School Flight Crew program has been active for three years, and it recently expanded its options for students. Flight Crew, which is designed to teach students in the special education program soft and vocational skills, recently started customizing clothing using a heat press and Cricut, volunteering at the Hope Christian Church Food Pantry and volunteering at a new venture from House of Neighborly Service. Those new projects all share a common goal with the program. “The end goal is to make (students) as independent as possible once they leave,” said Chelsea Adair, a cross-categorical and transitional teacher at CHS. That first area of growth has been used in the already operational Flight Crew Spirit Wear Store, which sells school merchandise. Students have used the heat press and Cricut, a home die-cutting machine, to create two custom shirts and a blanket. Read more in the March 20, 2019, issue.